Over the past two and a half if you've read any of my reviews, you'll know that I'm generally not a fan of fighting games. I don't really know why though. I mean, back in the day I loved the likes of Mortal Kombat, Tekken 3 and Battle Arena Toshinden 2. From unlocking new fighters and costumes, going head-to-head with a vast array of different enemies to, in Tekken 3's case, getting to watch a whole slew of cool endings for each character, there was a time when I enjoyed the genre. Nowadays I tend to steer clear of them. However, there was one franchise that I always meant to dip into, a franchise I first heard about when it received controversy due to one of its spin-offs. The series is Dead or Alive and the spin-off was Dead or Alive Xtreme Beach Volleyball; a game that caused a bit of a stink due to the fact that it seemingly focused on “realistic” breast physics. Aside from that controversy, the series itself is seen as a staple of the fighting game genre, so how does its latest instalment play? 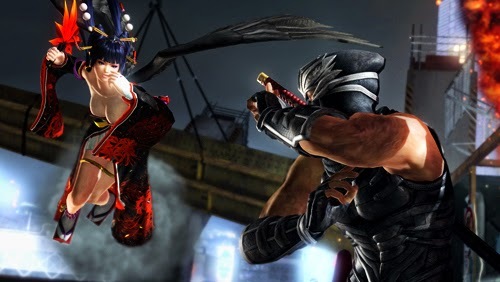 Developed by Team Ninja and out now on Playstation 4, Playstation 3, Xbox One, Xbox 360 and PC comes Dead or Alive 5 Last Round, the fifth main game in the series, but the third (yes, third!) update of Dead or Alive 5. Though Team Ninja have “updated” every single entry in the series so far, before Dead or Alive 5 those updates have essentially been ports to newer consoles. These updates took advantage of new radically different technology which I imagine justified a new purchase. However Dead or Alive 5 was originally released on last-gen consoles, and this update just doesn't seem, well, that updated. Call it a money grab or simply Team Ninja trying to better a previous effort, Last Round is fun, demands skill and has some decent replay-ability. Aside from this updated versions new bits, the core of the game remains intact. At its heart Last Round is a competent, challenging fighter that isn't pulled down by murky visuals and uninspiring characters. Levels are vibrant, alive and just busy enough without taking away from the action on screen. From Japanese trees slowly shedding their pink leaves amid a furious battle for survival, to going toe-to-toe with a foe in a level that is neon soaked and looks like something pulled from the streets of Tokyo, visually the game stunning to behold. The combat itself is fantastic and varied too, and in Last Round you'll find all the typical attacks and moves you'd expect from any respectable fighting game. From side-stepping, grapple attacks to essentially having a button assigned to the left and right arms and legs, each fighter is drastically different from the next and a joy to try and master. However, beyond the basics Last Round does excel past its competitors in two ways- Power Blows and counter-attacks. Power Blows are basically powerful attacks you can build up and unleash upon your enemy. They're unique to each fighter, let you quickly choose a piece of scenery to throw and break your opponent through, and ultimately earn you a K.O worthy of repeated action replays. On top of that the counter-attack system here is pretty great too. Pretty much every attack in Last Round can be turned into a counter attack, so if an opponent keeps going for a mid-kick and you respond with guarding with the analogue stick pointed in the same direction, you're character will instantly do a counter-attack. This system ultimately kills off the chance of other players spamming a certain move, as if they do and you know what's coming, counter-attacking will be easy. This update also brings along a whole host of extras, with some available in past updates of Dead or Alive 5, and some not. Regardless, Last Round contains 34 playable fighters, 26 stages and over 400 costumes. However, from what I'm seen and read online the core fighting mechanic of the game remains the same. If you're a huge fan of the series and bought the previous update of Dead or Alive 5 titled Ultimate, you may want to pass on this. However, if you've yet to play any version of Dead or Alive 5 and are into fighting games, you could do much, much worse. Dead or Alive 5: Last Round goes for a K.O and gets a 4/5.